David Henry (b. 1870), whose father arrived in Canada as a young man from County Armagh, Ireland, grew up near Kingston Mills and on Stephen Street with eleven siblings. He married Emma Olsen (b. 1861), who had come to Kingston from Norway. David worked on the railways, as a quarryman, as a carter, and for a time he ran a wood yard on Montreal Street. He and Emma raised their five daughters at 62 Stephen Street, next door to his parents, and just north of Robert Wallace’s quarry. 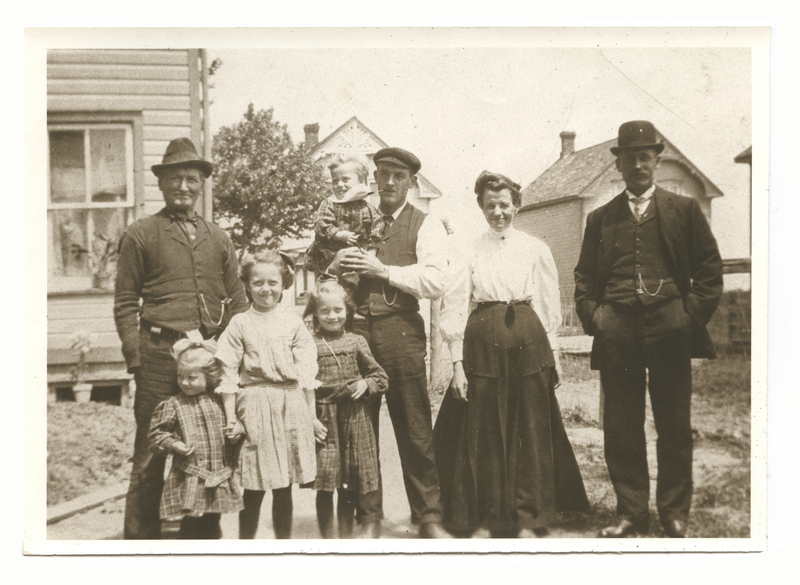 In this photo, taken around 1910, we see the couple with daughters Mamie (the oldest), Bertha, Daisy, and baby Florence. Emma is pregnant with their last child, Louise. David’s nephew Bill White, holding the baby, sold Fleischmann’s yeast door to door, and later ran a pool hall on Charles Street. Family friend Mr. Delph is the other person in the photo. In 1913, the family moved to 144 James Street. This house was to stay in the family until well after Louise’s death in 1990: her grandson Marc Shaw owned it for some years. 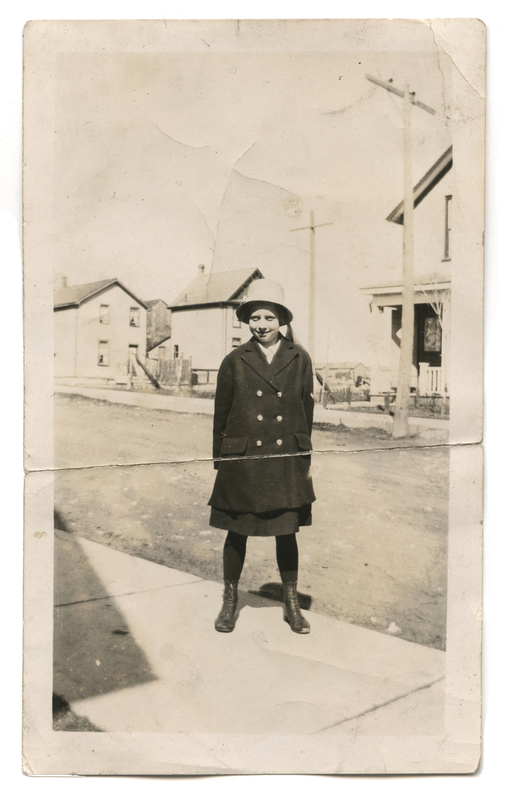 Of Emma and David’s daughters, Bertha went on to marry Dan Lockwood, who rose over the years to be a chief engineer with Canada Steamship Lines; they lived at 123 Patrick Street. Dan was Ukrainian in origin, but at some time before he met Bertha he changed his name, became a staunch Anglican, and left his origins behind — perhaps because Ukrainians were considered “enemy aliens” in Canada from 1914 to 1920. 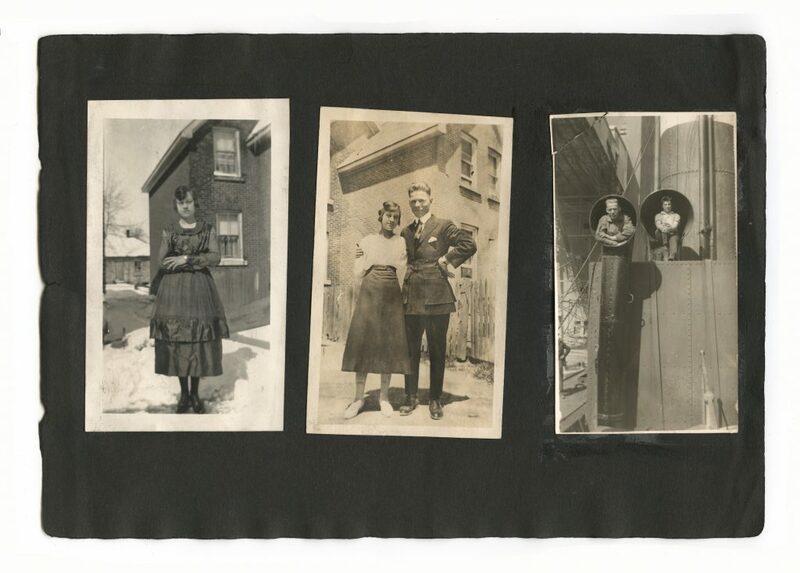 Louise, the youngest, married Art McLean before the Second World War, and they lived in Montreal with their daughter, Rose. 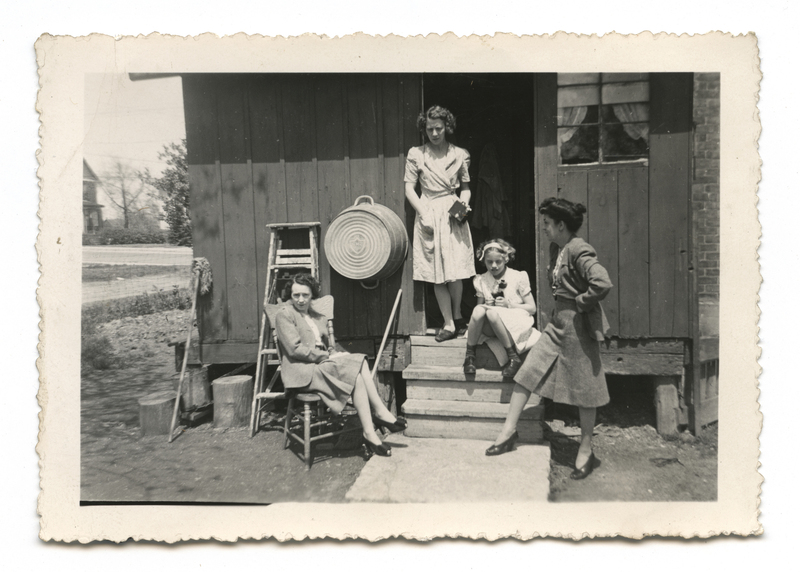 But Art was in the navy, and when he was lost in a torpedo attack on the HMCS Spikenard in 1942, Louise and Rose moved back to Kingston to live with her mother, Emma. Louise got a job at Bennett’s, and later worked at Sullivan Construction. As a child, Rose was always told not to ask about her father, because it would upset her mother; eventually, she even forgot what he looked like. For more on Louise Henry, see here. Warm thanks to Rose’s son Marc Shaw for photos and detailed family lore.